When it comes to photography, people are usually given two choices: to go with a DSLR camera or a mirrorless camera. While a DSLR camera can give you better image preview and a plethora of lenses and accessories, some people prefer to go with a mirrorless camera for faster shooting speed, better video quality, and, of course, much more compact body. Mirrorless cameras have attracted quite a lot of attention recently, especially because the big manufacturers have started to produce and fill the market with their mirrorless camera line-up. Sony is one of them, and Sony has introduced Sony a7II as an updated model of Sony a7. Hence, some people are wondering if Sony a7II is better than Sony a7, and which one holds the best value for the money. If you are having the same question, read on! As an updated model, Sony a7II retains all the key specifications and features of Sony a7, which include the 24.3 MP full-frame Exmor CMOS sensor, Bionz X Imaging Processor, 2.36 MP XGA OLED Tru-Finder electronic viewfinder, as well as a maximum ISO sensitivity range of 50-51200 with multi-shot NR, 5 fps burst continuous shooting speed, and adjustable shutter speed between 30 to 1/8000 seconds. 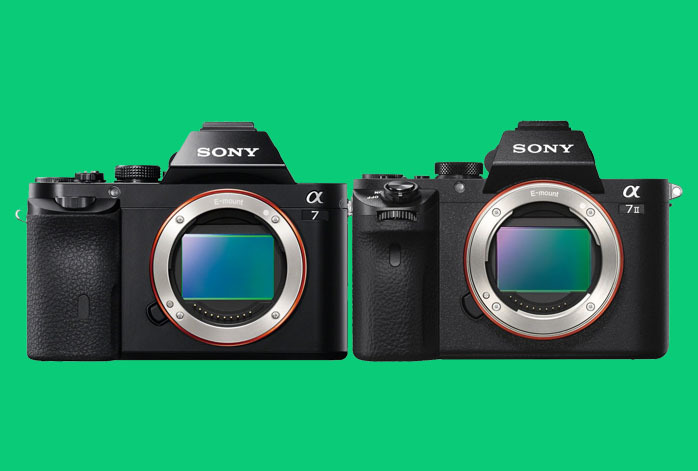 Therefore, Sony a7II and Sony a7 may be quite similar to each other in terms of picture resolution, and arguably also similar usability and output quality. Both models can provide exceptionally high picture quality. See also: Sony a7 vs a7R. However, perhaps the most significant upgrade that Sony a7II possesses is the addition of 5-axis image stabilization system. The system is an improvisation of the traditional anti-shake system that corrects the vertical and horizontal motions. Nevertheless, the system also compensates for rotational movement along the X, Y, and Z axes. The system can greatly correct the rotational movements of the human body. This feature can’t be matched by any other type of anti-shake systems. Also, what makes this feature even greater is that the manufacturer has configured the system to be compatible even with third-party manual lenses. The 5-axis image stabilization function is very helpful when you are doing macro shooting or working with a telephoto lens or in a low-light environment. Besides that, Sony a7II has a faster auto-focus (AF) system than Sony a7, making its performance slightly better. It now has rugged all aluminum-magnesium alloy with integrated metal mount bayonet, making it more durable and reliable. Sony a7II is indeed an excellent upgrade from Sony a7. It has an enhanced performance and a more rugged body. More experienced users will benefit the most out of the additions, but entry-level users will receive more convenience with it. Therefore, you should choose Sony a7II!